Properties in El Palmar average 4.6 out of 5 stars. CHALET EUGENIA WITH WI-FI. 500 meters from the beach. Property 5: CHALET EUGENIA WITH WI-FI. 500 meters from the beach. VILLA LA VOLANDERA EL PALMAR, with pool, plot, barbecue 400m from the beach. Property 7: VILLA LA VOLANDERA EL PALMAR, with pool, plot, barbecue 400m from the beach. Property 9: Chalet in Los Caños de Meca of 600m2 plot next to the countryside and the beach. Property 10: Villa in Los Caños de Meca of 1000m2 plot next to the countryside and the beach. Property 13: Beautiful and comfortable home with private pool. The pool is enclosed by fence. House 4 Sea and Sand. Villa with private pool and all possible extras. Property 35: House 4 Sea and Sand. Villa with private pool and all possible extras. House 2 Mar y Sombra Accommodation with private pool. 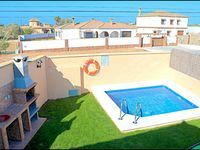 Property 40: House 2 Mar y Sombra Accommodation with private pool. Lo que m&aacute;s nos ha gustado es tener barbacoa, zona exterior y televisi&oacute;n en la habitaci&oacute;n. Lo que menos, que ni el sof&aacute; ni la cama eran muy c&oacute;modos.